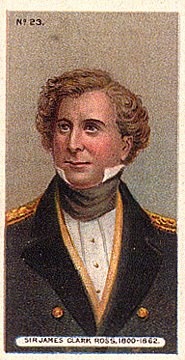 Sir James Clark Ross, 1800-1862. 096. SIR JAMES CLARK ROSS. Issued by W.D. & H.O. WILLS LTD. Card number 23 from a set of 50 entitled "Builders of the Empire". (1898). Size: Ca. 2.65" x 1.6". Recto: Ross in naval uniform. At bottom: SIR JAMES CLARK ROSS, 1800-1862. At the top left: No. 23. Verso: BUILDERS OF THE EMPIRE | A SERIES OF 50 | AAUTHENTIC PORTRAITS | SIR JAMES CLARK ROSS. | 1800 - 1862. | Distinguished Maritime discoverer. Entered navy at 12 years of age; accompanied his uncle, Sir John Ross, on his two voyages in search of North-West Passage, and Parry in his three Arctic voyages. His most memorable expedition was to the Antarctic ocean in 1839, which occupied 4 years. He commanded the Erebus accompanied by Crozier in the Terror, discovered Victoria Land, observed the volcano Erebus in eruption, made valuable additions to scientific knowledge in magnetism, meteorology, Zoology, &c. He planted the British Flag on the North Magnetic Pole. | WILL'S | CIGARETTES.